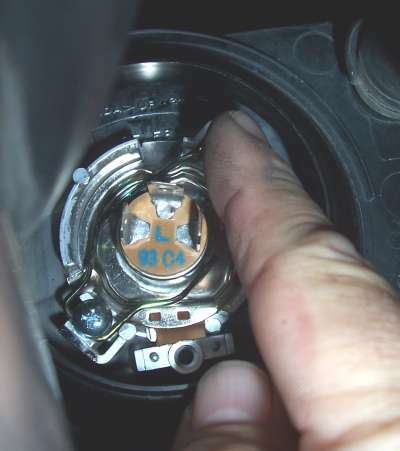 This page explains how to replace the left headlight bulb in the Valkyrie Interstate. Right bulb replacement is the same, I just wanted to clarify these pictures are of the left bulb. 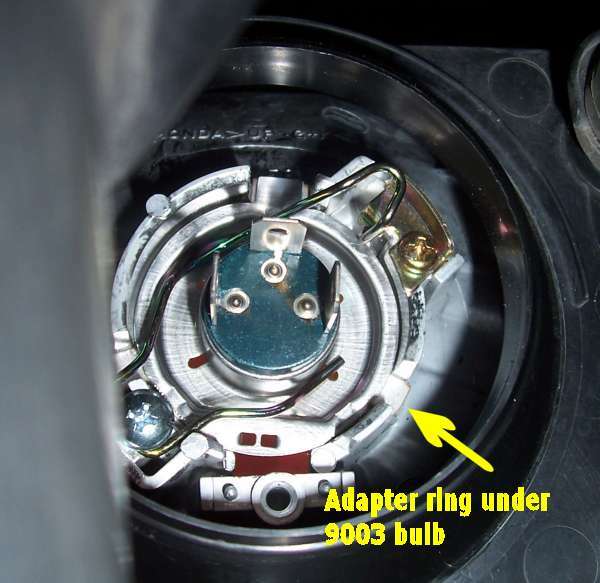 This help page also shows the use of an "adapter ring" for the use of 9003 automobile headlight bulb. You will need one (or two if your replacing both bulbs) stock 45/45 watt Interstate bulb. 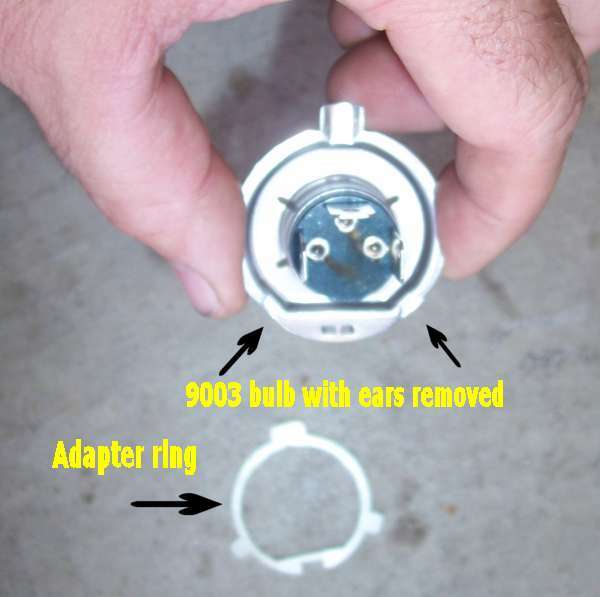 Optional bulb, 9003 automotive type bulb with adapter ring. Wattage of your choice. No tools needed for this job but a small flashlight, small hands and good eyes are optional!! Simply, all you have to do is unplug the wire connector, pull the boot off, unclip the bulb and the bulb will fall into your hand. If your like me though, simple never happens on the first attempt so here are detailed instructions for this simple process. 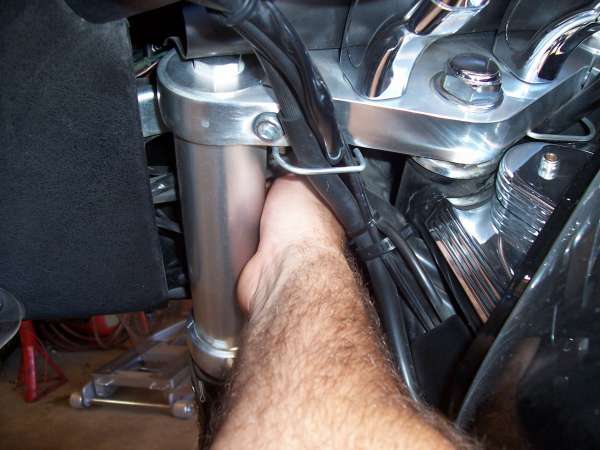 Turn the handle bars towards the right to access the left bulb. 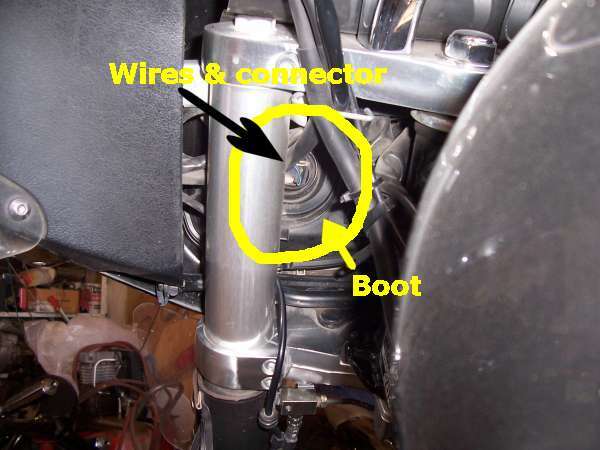 Kneeling beside the bike and looking into the fairing sitting just behind the left fork you will see a 4 inch diameter round rubber dust cover (boot) with a wire connector and the bulb wires in the center of the boot. Under that rubber boot and connected to the wires is the headlight bulb. The bottom right side of the boot and the wire connector can be seen in this picture just to the left of the plastic "wire tie". Reach in and remove the wire connector from the bulb. Sound simple enough right? If the bulb has been in the bike for some time it will probably be a little corroded and hard to remove. Do not to pull on the wires, pull only on the outside of the connector. Keep working at it, even if it seems it won't budge you will be able to get it free. Some side to side and top to bottom movement helps once you get it started. This (blurry) picture shows the connector removed. On the bottom of the rubber boot you should see a small tab. Grab the tab, pull outwards and remove the rubber boot. Look inside now and try to get a good mental image of the bulb and the gold colored spring retainer at this time. You will see that the spring clip simply hinges at the bottom left side and catches under a bracket on the top right side. When clamped in place the spring holds down the bulb with a left (long) and right (short) leg. There is a screw at the bottom left where the springs "hinges" for bulb removal. DO NOT TOUCH THAT SCREW! Don't loosen it or try to remove it. It will not help any at all. You will only drop it inside the headlight bucket assembly and may not be able to retrieve it without taking the entire fairing off the bike. Like I said, DO NOT TOUCH THAT SCREW! There is also another screw on the top right, DON'T TOUCH IT EITHER!! 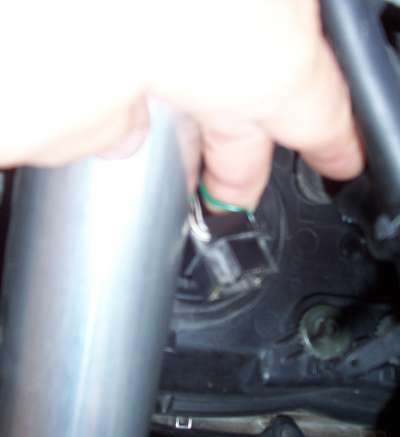 This picture shows the stock Honda bulb with all three alignment tabs in place on the perimeter of the bulb. The tabs hold the bulb in the proper position in the bulb bucket. Note the widest tab is at the top of the bulb. Also note how the spring is clipped under the bracket at the top right. Removing the bulb is very simple, just press down on the top long leg of the spring and move it to the left just slightly. Release down pressure and the spring will move out free of the bracket. 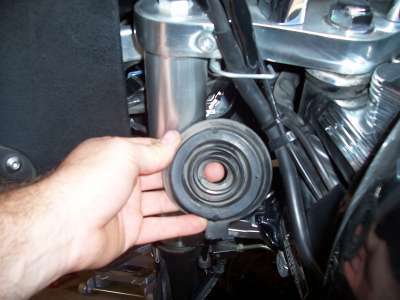 The spring "hinges" back towards the fork. It only takes a small amount of movement to accomplish this task. Just use a finger and slide it left then release. The bulb will be free and may even fall out of the bulb bucket. Now that you have the bulb remove you are ready to install the new stock bulb or a different brighter bulb. I personally like the Sylvania Silverstar 9003 ST/2 bulb. You must cut off the bottom 2 tabs of a 9003 for it to fit in the Honda bulb socket. Just clip the tabs off even with the bulb diameter with a pair of tin snips. These bulbs are rated at 60/55, just slightly more wattage then the stock 45/45 bulb. I have not heard of anyone having any trouble with melting of plastic parts with these bulbs. I buy these bulbs at the local Wal-Mart or most any automotive store. They seem to be readily available everywhere now. They put out a lot more light of a color that satisfies me enough to pay the much higher price for the bulbs. Others are also using higher wattage bulbs or different types of the "High output" or "Blue light" bulbs. Another common bulb is the 9003 "Cool Blue" bulbs also carried by Wal-Mart. Warning, use higher wattage bulbs at your own discretion. Too high of wattage may cause plastic parts to melt or wire rating capacities to be exceeded. Some of our fellow Interstate riders simply cut off the bottom tabs and use the bulbs without an available adapter ring. This may make the bulb sit with the front raised up and change the diffusion pattern of the projected light. Most not using the adapter ring adjust the aim of the light to compensate for this alignment error. The headlight aim adjustment knob is the black knob over the bulb (6 inches?) on each side. I personally like the adapter ring that several motorcycle accessory supplies sell. I'm not sure of the true manufacturer of this adapter ring but I ordered mine from Electrical Connection. http://www.electricalconnection.com/non-electrical/h4_shim.htm The rings currently are selling for $12.95 plus shipping. The rings make the 9003 bulbs sit flat and at the correct location for the best projected light pattern without much aim adjustment. This picture shows the tabs trimmed off on the Silverstar bulb and the adapter ring. 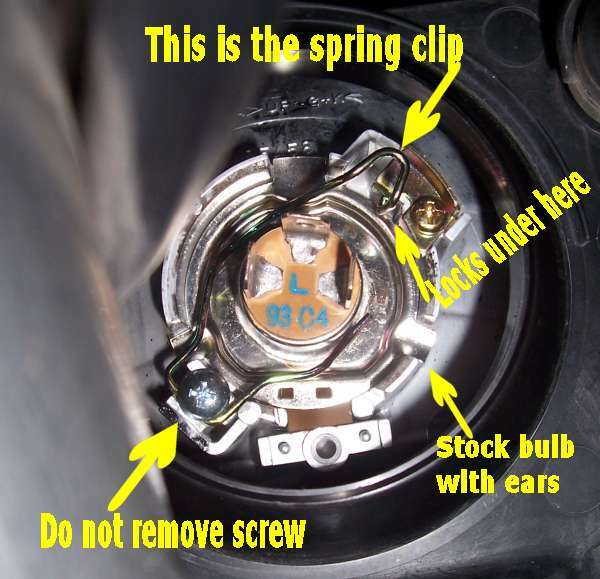 To install the stock bulb just place it inside the bulb bucket and latch the spring back. If you are using a 9003 bulb with the adapter ring place the ring around the glass part of the bulb and sit it down on the front metal surface. Never touch the surface of the bulbs as skin oils will shorrten the bulb life. After you get the bulb (and ring) in the bucket drop the spring back down to secure it. You may find that the spring seems so be higher then it should be. If so check and see if you are hitting the top prong of the bulb and work the spring up a little. It should just press easily down and then with one finger press and slide right to latch. Be sure all the tabs (and the adapter ring if used) sit in the gap around the outside of the bulb bucket. Replace the rubber boot with the tab on the bottom. It should slide over the outside easily. Reconnect the wiring and pat yourself on the back for a job well done!